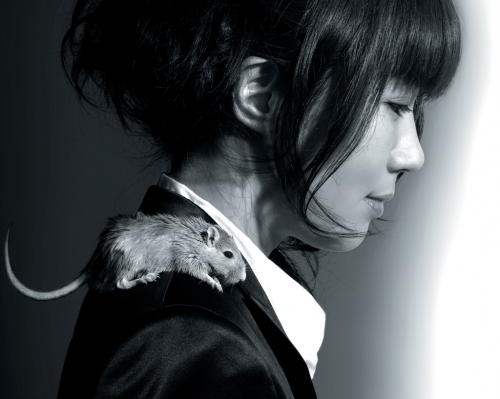 Yoko Kanno, one of the most talented modern composers. The purpose of this post is to appreciate Yoko Kanno, because she has made some great music. As with other entries in this series, no attempt is made to be comprehensive, or to assert that the songs presented are the “best” that Ms. Kanno has created. In other words, YMMV. The purpose is simply to pause and reflect upon the gift of music that she has given to the world. Unlike our last entry in this series, Yoko Kanno might be said to have no style. She is truly a master of many styles, from Classical, to Jazz, to Pop and Rock. Perhaps even more amazing than her incredible versatility, is the consistency with which she has produced excellent music. The visuals in the embedded amv are actually from the 2000 remake of Escaflowne. The music for this series is so incredible throughout that I probably could have ended up with five songs just from this one show. In fact, the OP, with vocals by Maaya Sakamoto, is great. “Dance of Curse” is a particular favorite of mine, however. Hearing it always fills me with energy, and excitement. Perhaps it triggers an adrenalin release in my body. If I were in a position to commission a dance troupe to choreograph and perform something for me, there is no question that this is the piece I would select. Cowboy Bebop is another series from whose soundtrack selecting five excellent songs would be just embarrassingly simple. In this case we have a live performance of the ED performed by Kanno’s band, the Seatbelts, featuring Mai Yamane on vocals. Hell, I think you could pull five excellent songs featuring Mai Yamane from the Cowboy Bebop OST! BTW, Yoko Kanno is seen briefly wearing a feathered “chief” head-dress, at the very beginning, and again at about the 20 second mark. This is another song from the Cowboy Bebop OST, with the Seatbelts in straight ahead mode. I wish I could have found a video that included Spike dog-fighting over the Martian colony, but this is really about Yoko Kanno, and her awesome music, so just close your eyes and enjoy the Jazz. A live performance from 2009, [that video has been removed, so I swapped in the version from the anime] Sung by Maaya Sakamoto. It shows Yoko Kanno’s skill as a world-fusion composer. The lyrics are also quite beautiful: What does everyone seek by fighting? Does spilled blood cause flowers to bloom? Maaya worked with Yoko on several projects, I provided a link to the Escaflowne OP earlier, so here is a link to the RahXephon OP, which was another Kanno/Sakamoto number. To round it out, we have a number that starts off like a Bulgarian women’s choir, but ends up dark, like Industrial Rock. Yet another side of the impressive Ms. Kanno. I hope you enjoyed the music! Since this post is dedicated to appreciating Yoko Kanno’s music, I think I’ll close by pointing you to the mystery of Who is Gabriela Robin? Anyhow, I’ve really enjoyed the works she’s put out and the mixture of both video game music (Napple Tale, Ragnarok Online 2, Uncharted Waters) are soundtracks I absolutely adore, and showcases her wide level of musical diversity. Though I’ll always prefer her music for stuff like Turn A Gundam and Macross Frontier because of my symphonic biases, Bebop is always a strong entry and has earned one of 6 permanant spots in my car’s CD player tray. Personally I don’t take the plagiarism charges seriously. IMO, even in the days when there was very little music available, composers (even great composers) looked carefully at other composer’s music and used it as a guide. In general, I believe that is how 90% of all art is made: bricolage. Realistically, if one were to want to reference a genre (say Country), one would need to incorporate certain elements (e.g. major pentatonic, violin, guitar …) in order to get the idea across to the audience. That is what style is. Yoko Kanno is a type of artist who works across styles. In order to sound like a 19th century Romantic symphony, you adopt the musical palette and idioms that will help you get that idea across. Looking towards the future, without radically re-imagining the musical toolbox (such as adopting twelve-tone or something), the melodic and harmonic search space WILL dwindle. In other words, the more people try to come up with unique melodies or harmonic progressions, the fewer unused ones remain. In the end, truly unique compositions will have to be abandoned, because the number of permutations is not infinite. Just thought I’d ask. My position is that she’s come dangerously close a few times, but that she’s generated plenty of original stuff so that gives me the comfort of knowing she’s capable of working off her own musical talent in addition to drawing inspiration from others. that of an oboe (to pick extreme examples), so my weaving the sounds of the two instruments together, you can come up with with something that sounds fresh (which is a departure from the strictness of “uniqueness” but still worth considering when evaluating music). So the two, taken together, means I can still be optimistic about music’s progression as time goes on. Regarding timbre: this is true, but if you play the same melody people will consider it the same (albeit with a fresh twist). An example is bluegrass musicians playing a Led Zeppelin song; it will sound different, and that might make it interesting, but people will consider it a cover. I’m serious about running out of music. There are only so many permutations of 7 tones. Rhythmic variety can go a long way, but it can’t go infinitely. Mathematically the melodic space is closed. Harmonically things are even worse — Jazz has proven that! There really are only a handful of primitive chord progressions when you incorporate Jazz substitutions. Things get a little more complicated by the basic song structure itself (e.g. # of bars, and whether you incorporate a bridge). Now I’m talking largely about popular music, obviously “classical” music has more variety in song structure. like zzeroparticle, I tend to favor orchestral music so I find myself falling in love with her works on Bebop, Wolf’s Rain and Escaflowne. Dance of Curse was indeed a catchy song but it was a little repetitive. I like orchestral scores as well, but , heck, I like all sorts of music, which is one reason I really like Yoko Kanno, her diversity of musical styles. I had the pleasure of watching Yoko Kanno perform, albeit briefly, during AX this year as a mystery guest at a concert. Vocalists who often work with her, like Maaya Sakamoto and May’n, say that Kanno always challenges them to explore new aspects of their range with her songs. May’n, for example, always sang in a lower voice until Kanno asked her to go higher for some Macross F songs. I also suspect she tailors some of her songs to match certain vocalists’ talents. Yakusoku wa iranai and Triangler, for instance, fit Maaya Sakamoto so well, bringing out the best in her younger and childlike as well as her more mature, intense and pointed voice. This series that you’re doing — first Ali Project, now Kanno — is great! I’m looking forward to seeing who you’re featuring next. I think you are right. Kanno seems to give a lot of thought towards the kind of sound she is going for, and uses the vocalist as a carefully selected instrument, with her own unique timbre. Kanno is definitely one of the best musicians in the world right now. She has done amazing music that inspires many souls to be creative. Also, I think one of the wonderful things about her is that she has brought back Jazz in a way… my opinion. Definitely an exciting contribution to music of the world. I feel fortunate to have had the opportunity to listen to her music, even though she makes it so far away.